Last week I left for a little break on a jet plane. I had a milestone birthday and three of my best friends have the same milestone birthday within three weeks so we ditched work, children and took a short break in a lovely villa in Bali. We have only been talking about doing something like it for the best part of the last five years. So with the knowledge I once lost my boarding pass between the check-in counter and the gate - in the small airport in Perth without stopping to eat or anything- I decided to make myself a little travel wallet. Somewhere to put all the travel docs, insurance info, have my passport within easy reach as well as a little pocket at the back to stash my boarding pass! And since I worked out a design I thought I might as well put together a tutorial to share. First off though I need to apologise for the pictures. The light today was terrible and some photos couldn't be used at all! Rule a line down the centre of the pocket panel and Mark the 1 /4” seam line on one half. Press the paper backed fusible web into this rectangle. Fold right sides together and sew closed leaving a small gap for turning. Remove paper backing and open out. Be careful not to let it stick to itself and pull out all creases before pressing. Press to stick both halves together. Topstitch folded edge. Do not sew opening closed but do press seam allowances inward. Measure 4⅟₄” down from the top of the front panel to mark bottom edge of wallet front. Centre pocket in a pleasing location, pin. Using a ⅛” topstitch around side and bottom of pocket to secure to front panel ensuring you close the opening at the bottom. Fuse fusible fleece to the back of the front panel ensuring seam allowances left clear. Fuse heavy interfacing to the back of the lining panel - also ensuring seam allowance left clear. Mark 4¾“down from top edge (pocket opening). Sew top edge and bottom and sides between the marks you made. Clip sewn corners. Turn out. Topstitch along the bottom edge - the one without the pocket. Mark 5½” down from the front flap edge. Fuse fusible fleece to outer fabric as before leaving seam allowances free on the larger marked area, this will become the front flap and top edge. Fuse heavy interfacing to the other half of the outer panel, keeping seam allowances free. Fuse heavy interfacing to the back/flap lining panel. Sew front and back panels together this time making the mark 4¾” from the back edge - the one with the interfacing. Turn out. Place passport pocket half on cutting mat with lining side facing up. Mark 5¼” from the pocket edge. Draw a line across. Place back/front flap panel lining side up on top with the bottom edge on the line you drew. Sew front panel to back panel along this line with a narrow topstitch. The side openings in the front and back panels will be either side of the line you just sewed. 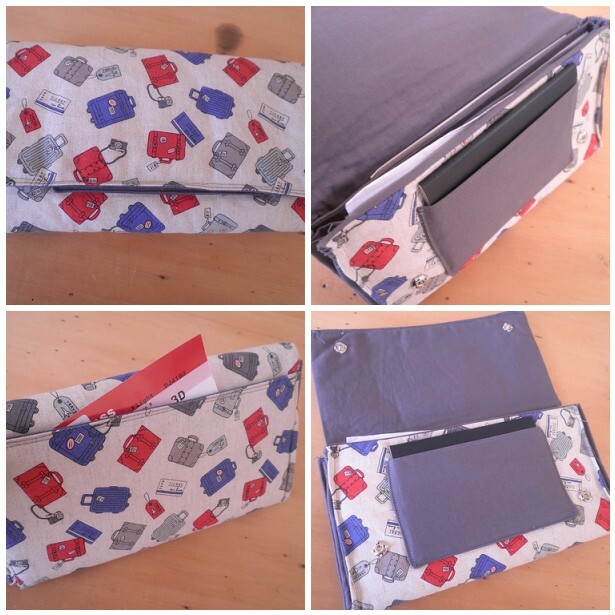 Make as for front pocket by fusing paper backed web to one half keeping seam allowances free. Sew along long edge to form a tube, turnout and press. Leave side edges raw and do not turn in seam allowances. A ⅛” basting may assist for the next step. Prepare the side panels by sewing right sides together along the raw short edge. Turn out and press. Mark ¼ seam allowances on one side. Flip and mark centre and equidistant between the centre line and the seam allowance on each side. Insert the side panels into the opening at the back off the wallet matching the marked line and the folded edge. Fold side panel towards middle of the wallet. Pin including the back pocket. Sew down one side first. Through all layers, go slowly. Consider a walking foot. Aim for a ⅛” seam. Then it gets fiddly. Align the raw edge of the first divider with the first line you drew. Fold over the side panel enclosing the raw edge with the side panel. Pin. Sew. Repeat with the next two dividers. Finally insert the end of the side panel into the front side seam space. Pin, pushing the dividers to the inside to form the edge and allow room for the presser foot. Sew. Then it gets really tricky. Repeat on the other side. Because there is less room for movement it will be a little more awkward. Sew press studs to the front either side of the passport pocket down the bottom. This is amazing! Just wondering - and I may have missed it - what is the finished size?